Hotel Trio was amazing. Great staff, breakfast, and room. We will return. The second bed was in a second room. The kids were in there and we had more privacy. We keep the main room which had the tv. Where to find Ukiah hotels near an airport? Where can I find hotels in Ukiah that are near tourist attractions? Ukiah has a variety of affordable and luxurious places to sleep. Within a convenient 0.1-kilometre (0.06-mile) radius of Ukiah's center travelers can select from 14 Expedia-listed hotels. 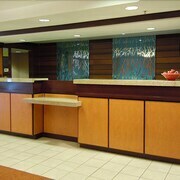 The Economy Inn, is the perfect choice for visitors as it is the most centrally located accommodation option in Ukiah. If you have a budget to stick to and are simply looking for mid-range or low-budget Ukiah places to stay, you'll find that there are also enough affordable places to choose from in the area. 3 kilometres (2 miles) from Ukiah's heart is where you'll find the Travelodge Ukiah. The Super 8 Ukiah is only 1 kilometre (0.6 miles) away. The Americas Best Value Inn and the Days Inn Ukiah are two of the other recommended lower priced options that you could look into. The Vichy Hot Springs Resort & Inn is 5 kilometres (3 miles) from the heart of Ukiah. Or, alternatively, the The Lodge At Blue Lakes is 17 kilometres (11 miles) away. 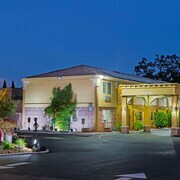 Two other Expedia-listed hotel and apartment options worth checking out around Ukiah are the Baechtel Creek Inn, an Ascend Hotel Collection Member and the Hampton Inn Ukiah CA. If you have the time, why not discover the many other attractions of Northern California while you are in the region? View Northern California's mountains and valleys. You should also explore some of the region's art museums, art galleries and street art. Popular pastimes in this particular part of United States of America include snowboarding. 90 kilometres (56 miles) from Ukiah you'll find Williams, where visitors can enjoy Venice Park and Sacramento Valley Museum. The Ramada Williams and Econo Lodge are a few of the Expedia-listed accommodation options in Williams. Alternatively, you could consider staying at Fulton, 80 kilometres (51 miles) to the southeast of Ukiah, where you'll find the Hilton Garden Inn Sonoma County Airport and Best Western Plus Wine Country Inn & Suites. If you're staying in Fulton, be sure to check out the Old World Winery and Kendall-Jackson Winery. 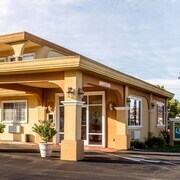 For travelers planning on flying via Sonoma County Airport, you may like to book a bed at Hampton Inn & Suites Windsor - Sonoma Wine Country, or Holiday Inn Express® Windsor Sonoma Wine Country, which are both conveniently located nearby. What are the most popular Ukiah hotels? Are there hotels in other cities near Ukiah? What other types of accommodations are available in Ukiah? Explore Ukiah with Expedia.ca’s Travel Guides to find the best flights, cars, holiday packages and more!